Welcome to Kenmore Bridge Club. Looking for some adventure in your life, but not into extreme sports? Join us for the next best thing... A Game of Bridge. 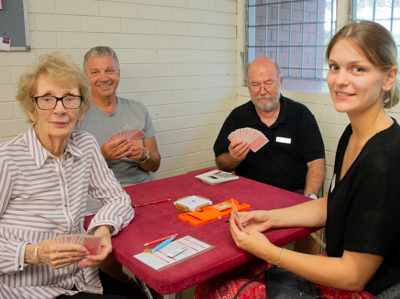 Kenmore Bridge Club Inc., located at the Kenmore Community Centre (98 Brookfield Road, cnr Branton St, Kenmore Hills) has rapidly grown to over 400 members in its seven years. A vibrant young club, we are, passionate about ensuring our players are continually developing their game strategies in a supportive environment. Bridge players are invited to attend any session without a partner and will be guaranteed a game. We have 12 sessions each week in addition to recurrent beginner and special lessons. It is exciting to discover our supervised and regular duplicate sessions are providing a social community service of 1800 hours each week. We provide more adventure than you can handle. Bridge hands are computer dealt and hand records available at every session. Bridgemates are used for electronic scoring with results available at the end of play on our website. Affiliation with The Queensland Bridge Association (QBA) and The Australian Bridge Federation (ABF) support our codes of practice. Anyone is welcome to play at Kenmore Bridge Club….our not-for-profit, volunteer and community-based organisation welcomes all interested bridge players - membership is not a requirement to play….just a sense of adventure and a willingness to connect with the community. And if you are up for an adventurous read…then we have an extensive library providing both classic texts and new twists on some old conventions …all books are available to all our members. If you, and any family or friends, feel the need for a sense of adventure, we would love to see you at the table! Bridge for Brain Research was played at KBC in May. All table fees and donations were given to Neuroscience Research Australia (NeuRA). NeuRA is an independent, not-for-profit research institute based in Sydney, Australia. As a leader in brain and nervous system research, their goal is to prevent, treat and cure brain and nervous system diseases, disorders and injuries through medical research. We are always pleased to donate to this worthwhile research as playing bridge directly provides us with some prevention towards debilitating ageing diseases.